Prominent & Leading Manufacturer from Surat, we offer trimming lace. 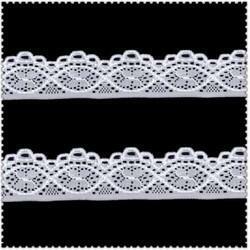 As a leading name of Trimming Lace, we have achieved great laurels for our company. This beautiful piece is designed and knitted, according to the ancient lace craft and pattern. This one is made by strong threads and yarns. The offered lace is knitted by the expert and experienced lace designers. This one from our side is very aesthetically designed, to provide a classy look and appearance.